Tabletop gaming is a huge industry, but has largely been left on its own by major brands other than the all too common “let’s slap a popular name on an existing game and call it new.” Consider the seemingly endless reskins of Monopoly, or the occasional attempts to cash in on a big brand with a terrible game that will fool a few gullible buyers at Target or Barnes & Noble. And that’s fine with me—our little niche is doing just fine without big brands busting in like the Kool-Aid Guy to muck everything up for us. 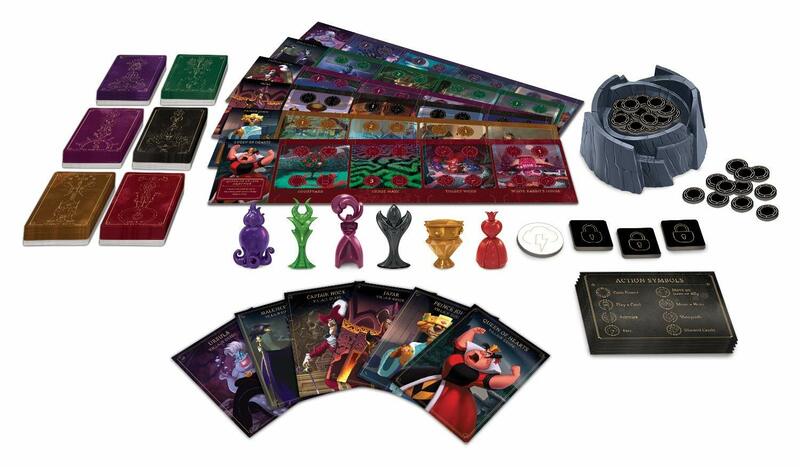 So when a copy of Disney’s Villainous, a new, licensed game produced by Wonder Forge and designed by the Prospero Hall group, arrived for me to review, I was more than a little skeptical—even as a longtime Disney employee* and general fan of the brand. Given how much of Disney’s name and product line was aimed at younger kids, what were the odds that there would be a real game underneath the character names and images all over the game? *: Full disclosure—As a full-time employee of ESPN since 2006, I am a Disney cast member, and even have the ten-year plaque and pin to prove it. However, I gave no additional consideration to this game on that basis, and received it through normal review channels, not through anyone involved with the Walt Disney Company. I’ve probably said enough by now that the lede is obvious—Villainous is a good game, a really good, smart game, one that builds well on existing game ideas but simplifies them in a way that brings a fun, accessible gaming experience to people who might buy it because of its branding rather than because they’re familiar with modern tabletop titles. The heart of the game is a deckbuilder experience without the ‘building’ part—you start the game with your entire deck, and have to figure out how to manipulate your hand and the deck to get the cards you need out of it, but the game itself is short enough that you may never have to replenish the deck, and it’s not complicated by decisions about which cards to acquire since you already have everything you need to win. Villainous is an asymmetric game, with six villain decks in the base game—there’s already talk of expansions, and the game’s structure is open enough that they can continue to produce new decks without limit—that each have unique decks and objectives to win. Each player picks one villain, takes a player deck and a Fate deck for that villain, and a board of four spaces that contain all the actions the player can take over the course of a game. Players shuffle their decks and draw hands of four cards, and then on each turn will move their token to one of their four board spaces and take up to four actions depicted on the spaces they choose. The actions are simple: play a card, take Power tokens (the game’s currency), activate a card, vanquish a hero someone else has placed on your board, Fate an opponent (which is how you interact with other players, and stick them with heroes to vanquish), and discard as many cards as you like to refresh your hand. At the end of a turn, you draw back up to your hand limit of four cards. Play continues until someone reaches his/her villain’s objective. The objectives and decks vary widely across villains, and each deck is tightly calibrated to the specific objectives and obstacles for that villain. Some objectives are simple; for example, Prince John, of Robin Hood, has to begin a turn with 20 Power, and if he’s not Fated he can win in nine turns by alternating between the spaces that grant him 3 Power and 2 Power. Others are more involved: Jafar, my personal favorite of the decks so far, must find and play two unique items in his deck, one of which brings out the Genie Hero card from his Fate deck, and then must use a Hypnotize card (there are two in the deck) to control the Genie, while also using Move card actions or the action on the Iago card to relocate one of those unique items to his home space. Choreographing that combination of moves is like a puzzle, making the Jafar or Captain Hook decks more involved and more fun to play than Prince John or Maleficent (who just has to play Curse cards to her four board spaces, while opponents try to remove them with Fate cards). The only interaction among players comes from the Fate action and Fate decks, which are critical to playing the game well. When you hit a Fate action space on your board, you get to choose any opponent except the last player who was Fated, draw two cards from the top of his/her Fate deck, and choose one card to play if you’re able. (It’s possible to draw two Fate cards you can’t play, in which case, womp womp.) These cards can cover up two actions of the four on most Villain board spaces, limiting your opponent’s actions on certain turns. Fate cards include Heroes whom you play to the opponent’s board, and who often have specific abilities that hamper your opponent—Apu, in Jafar’s Fate deck, can steal the Magic Lamp, the one item Jafar must have at his home space to win the game. They also include Items and Effects that can screw with your opponent’s plans, and often force your opponent to spend Power to play more cards and then to expend cards to vanquish Heroes or to relocate Fate cards to get them out of the way, since when you vanquish a Hero with your own Ally cards, you must discard the Ally cards you used. For the Queen of Hearts, for one example, who needs her Ally Card Guards in all four spaces to be able to turn them into wickets so she can try to win the game, that can be especially damaging. Other Villains can benefit from the Heroes in their own ways—Prince John can move such cards to his jail, so they don’t cover up any actions, and then play the Lovely Taxes card to collect extra Power for each Hero on his board, even those he’s imprisoned. The core game play of Villainous will be familiar to anyone who’s played standard deckbuilders in the Dominion mode—take a hand, play some cards, discard some cards, draw back up to your hand limit—but shortens turns and reduces decisions with a hard limit on the number of actions you get in any one turn and by eliminating the acquire/purchase aspect of true deckbuilders. The decks in Villainous are built; you just shuffle and play. There’s a lot of text involved, and enough of a planning element that the recommended age range of 10 and up is probably about right. The game can play up to six at once; we’ve played with two to four, and games take under an hour, although I imagine with six players you’ll probably end up playing longer, and players may have long downtimes between their own turns. The six decks in the base game also give it plenty of replay value, with more to come if and when Wonder Forge issues expansions. Villainous was one of the big hits at Gen Con last month, for good reason, and I think it’s going to see a big surge in interest as we approach the holidays, as it’s almost alone at the intersection of true tabletop gaming and mass market culture—and it’s a damn good game on top of all of that.